Cloud-Native Content Services for Spring. For creating services that manage content such as documents, images and movies. Build your own cloud-native, scale-out headless content services using the exact same components as the Enterprise Content Management (ECM) vendors such as Documentum and OpenText, without the hassle. Spring Content Commons - Core Spring concepts underpinning every Spring Content project. 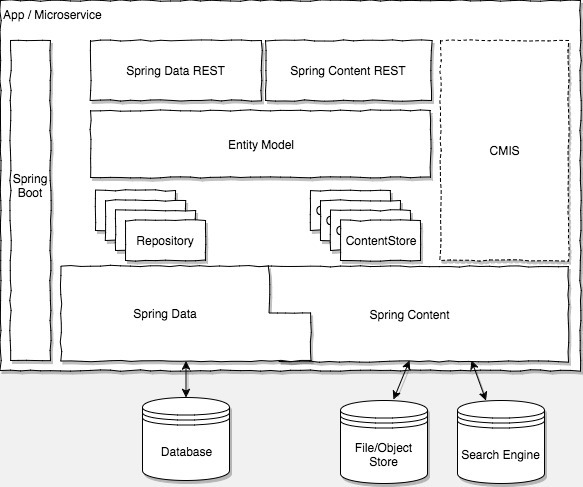 This defines a simple JPA entity with a few structured data fields; title, authors and keywords and one Spring Content-managed data field; @ContentId. The structured data fields are handled in the usual way through a CrudRepository<SopDocument,String> interface. For more, check out our intial Getting Started Guide, or watch one of our SpringOne talks 2016, 2017 @11mins and 2018.